Gov. Larry Hogan with Montgomery County elected officials announced funding to ease congestion on I-270 and build a new interchange. Photo by Governor’s Office. I-270 FUNDS ANNOUNCED: While much of his party gathered in Cleveland for the Republican National Convention, Gov. 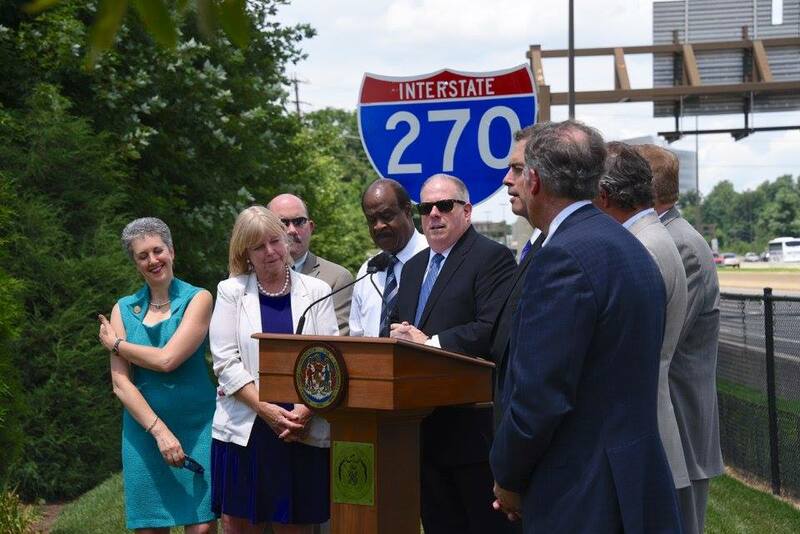 Larry Hogan journeyed to deep-blue Montgomery County on Monday to announce an additional $100 million in state funding to ease traffic on chronically congested Interstate 270, reports Ovetta Wiggins in the Post. “There’s a convention?” Hogan quipped when asked about his decision not to attend the formal nomination of White House hopeful Donald Trump. Maryland officials have $100 million for the thinkers who can figure out how to move the most vehicles the farthest and the fastest up and down Interstate 270, reports Danielle Gaines for the Frederick News Post. Hogan announced nearly $230 million in funding to reduce congestion on and around the interstate between the Capital Beltway (I-495) and Frederick. Andrew Metcalf of Bethesda Beat reports that Hogan said the highway isn’t able to handle more than 250,000 commuters who use it each week day. “Any Marylander who has driven this route would quickly tell you that it’s sometimes a traffic nightmare,” Hogan said. FUNDING SHUTTLE SERVICE TO BOOT: Gov. Larry Hogan brought a smile to the face of one state senator from Montgomery County Monday when he announced the state would fund the cost of the county’s free shuttle bus program that will transport local commuters between stations during Metro’s SafeTrack repairs on the Red Line later this year, Andrew Metcalf reports for Bethesda Beat. Tamela Baker of the Hagerstown Herald Mail reports that the Hogan administration is adding $1 million for shuttle bus service that will transport riders between Metro stations, the release said, to ensure that citizens are still able to get to work when Metro repairs take place later this year. YUMI HOGAN TOURS ART STUDIO: Maryland first lady and artist Yumi Hogan took a tour of Make Studio in Hampden, a place where adult artists with disabilities flock to to develop their skills, try new techniques and connect with other artists. For many of them it is a calm time to delve into their professional artistry, a time they don’t usually have anywhere else, Andrea Cwieka of the Daily Record writes. McDONOUGH TOUTS POSSIBLE WIN: Del. Pat McDonough followed his state’s GOP delegation to the Republican National Convention this week in search of donors for his congressional campaign, insisting that this year’s stranger-than-fiction political climate could help him produce one of the biggest election shockers of 2016 — him unseating seven-term incumbent U.S. Rep. Dutch Ruppersberger, Josh Hicks reports for the Post. MARYLAND AT THE GOP CONVENTION: Josh Magness and Julie Gallagher of CNS report from Cleveland that despite the split in the Republican Party over Trump/Not Trump, many are seeking party unity. “Anne Arundel County Executive Steve Schuh said at the Maryland delegate breakfast Monday morning that Trump was not his first choice in the 2016 Republican primary. However, as a party leader, Schuh said he must accept the GOP voters’ choice, as 60% of them voted for Trump in the state’s April 26 primary.” The article appears in MarylandReporter.com. Two Maryland delegates to the Republican National Convention have signed a letter opposing the convention rules that will be considered on the floor today — arguing that party leadership missed an opportunity to give more authority to grassroots activists, John Fritze reports for the Sun. Nicolee Ambrose and Jim Crawford, the two delegates from Maryland who served on the convention rules committee, had supported rules changes that would have given more power to convention delegates, stripping it from the RNC chairman and other party leaders. The latest acquittal of a police officer charged in the arrest and death of Freddie Gray won a round of applause on the floor of the Republican National Convention as Milwaukee County Sheriff David Clarke mentioned the “good news” out of Baltimore — the acquittal Monday of Lt. Brian Rice — and described Baltimore State’s Attorney Marilyn J. Mosby as an “activist” who undertook a “malicious” prosecution, John Fritze of the Sun reports. Tom Hall of WYPR-FM talks with Liz Copeland of the Urban Conservative Project of Maryland, and addresses what the Trump candidacy will mean for down ballot races and the Maryland GOP. BOSSIE, POLITICAL MOVER: David Bossie, the 50-year-old Montgomery County man elected in May to represent Maryland on the Republican National Committee, is chairing the state’s delegation to the RNC, fundraising for GOP candidates and using his thick Rolodex to lure speakers to address the state’s delegates. “He’s one of the most important strategic entrepreneurs in the conservative movement in the entire country,” former House Speaker Newt Gingrich. He’s also head of the Washington-based Citizens United, reports John Fritze for the Sun. AA COUNCIL TERM EXTENSION PULLED: Amanda Yeager of the Annapolis Capital reports that a measure to allow a third term for Anne Arundel County Council members will not make it to the ballot. Councilman Pete Smith decided Monday night to withdraw the resolution, which proposed extending the possible tenure of council members from eight years to 12. As a charter change, it would have been passed on to voters to approve or reject if endorsed by the council.